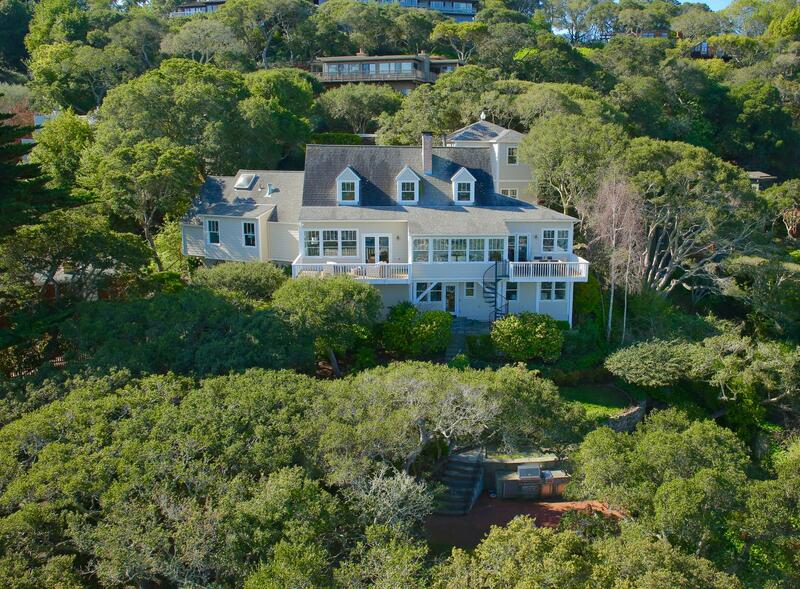 This magical residence set in a peaceful, quiet and enchanting setting, exudes character, style, and elegance. 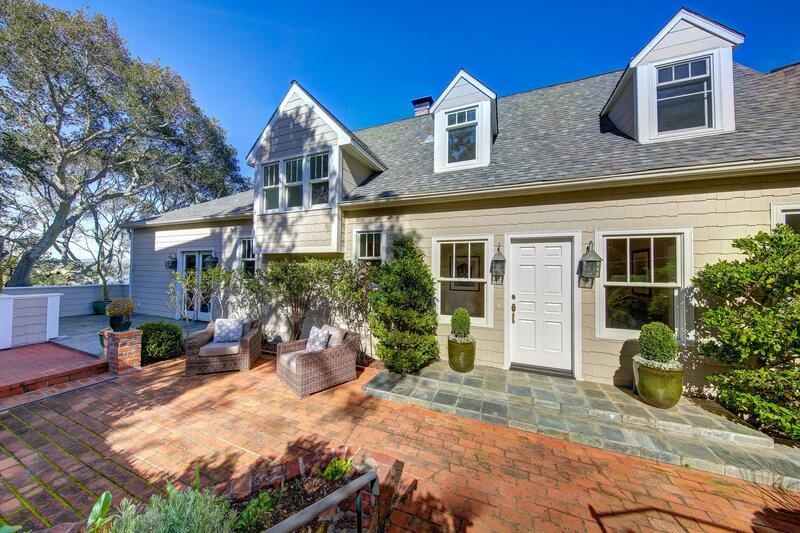 The shingled 5+ bedroom, 4.5 bath, 4,860 +/- sqft home was designed for comfortable living and is situated on an approximate ½ acre of land. 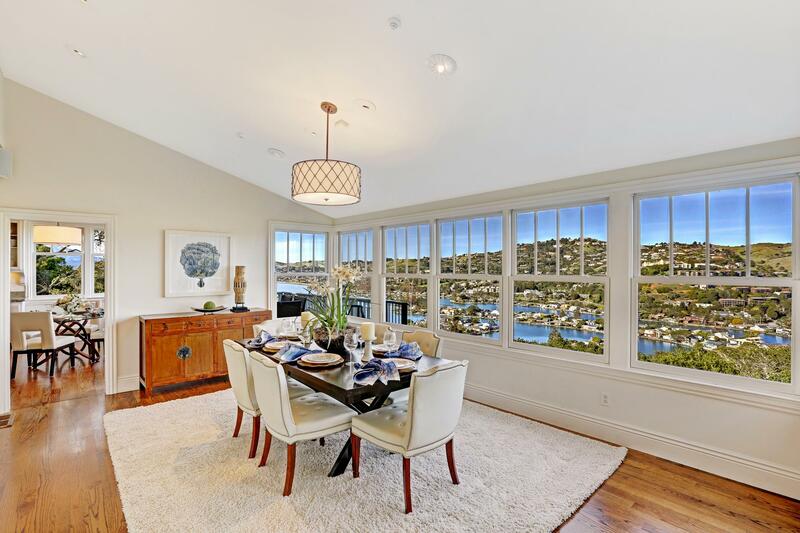 The main living spaces are designed to highlight the sweeping views spanning the Belvedere Lagoons, Corinthian Island, Angel Island, the sprawling Tiburon hills, and the San Francisco Bay. 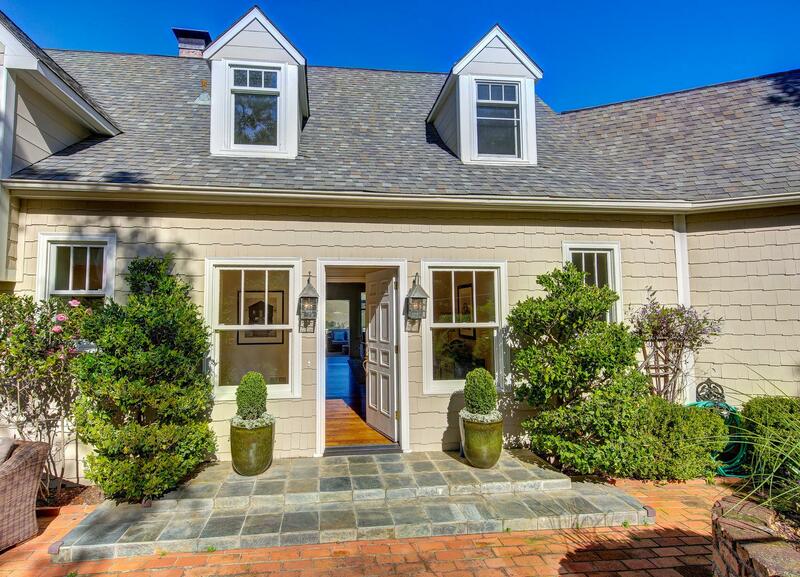 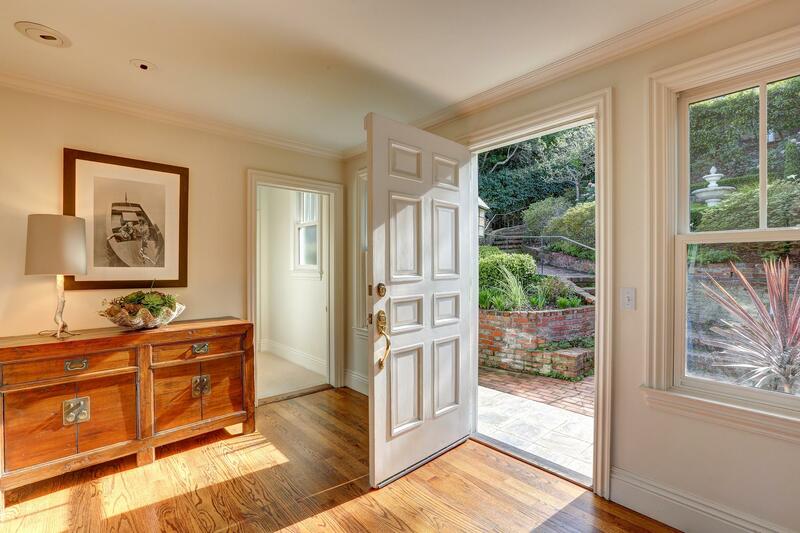 This East Coast inspired residence offers meandering brick walkways from the street level leading to the front entry offering an inviting entrance to this tastefully appointed property. 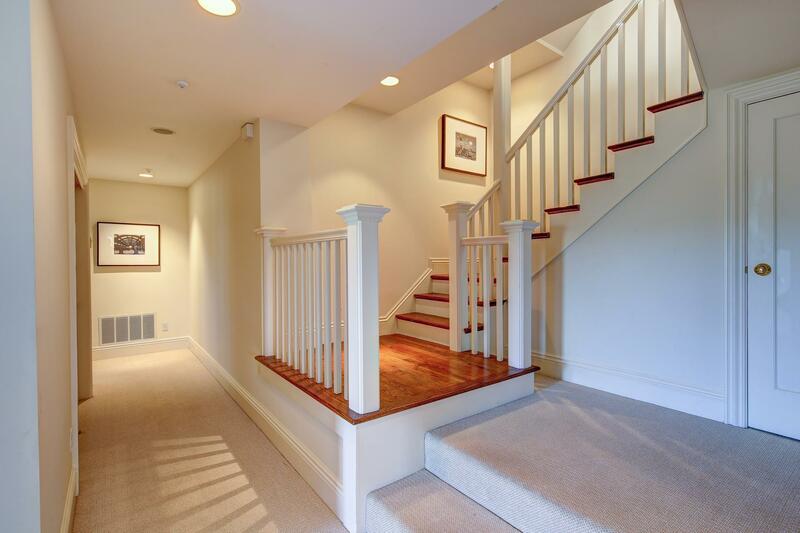 The foyer opens to the luxurious living room with beautiful hardwood flooring which extends through all the public areas on the main level and also interior stairways. 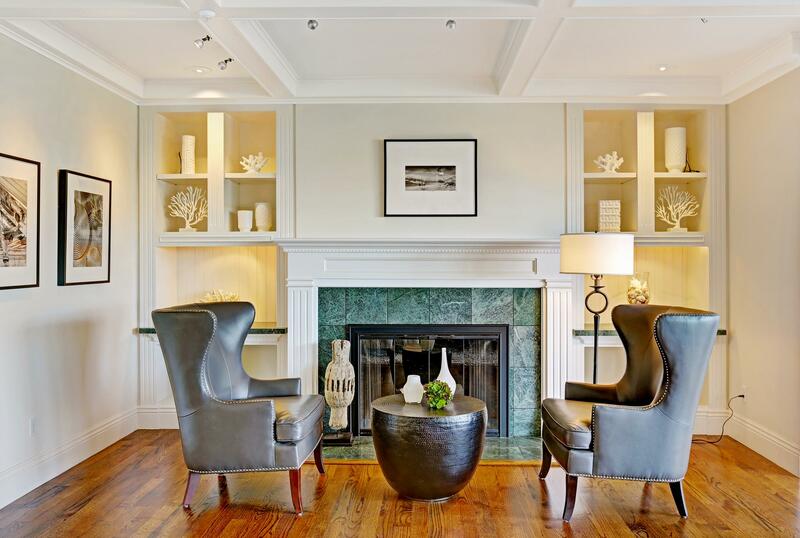 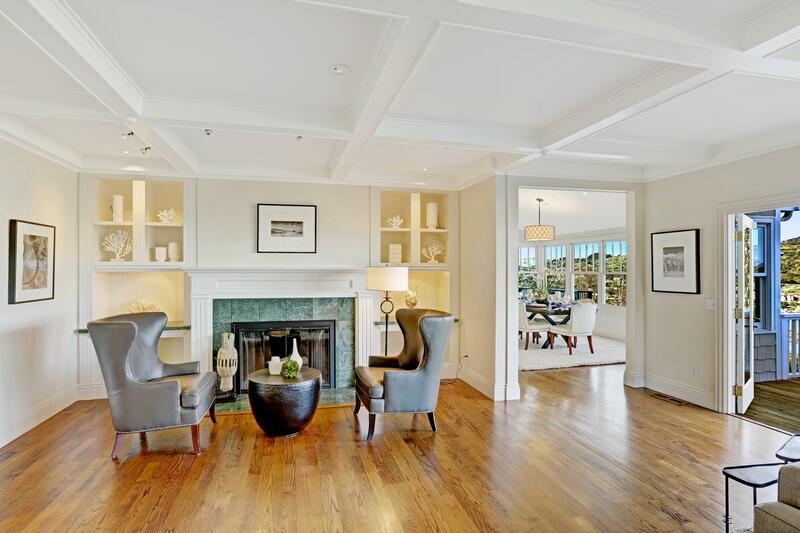 The open and airy living room offers coffered ceilings and a wood burning fireplace, nicely centered with custom mantle and recessed shelving on both sides. 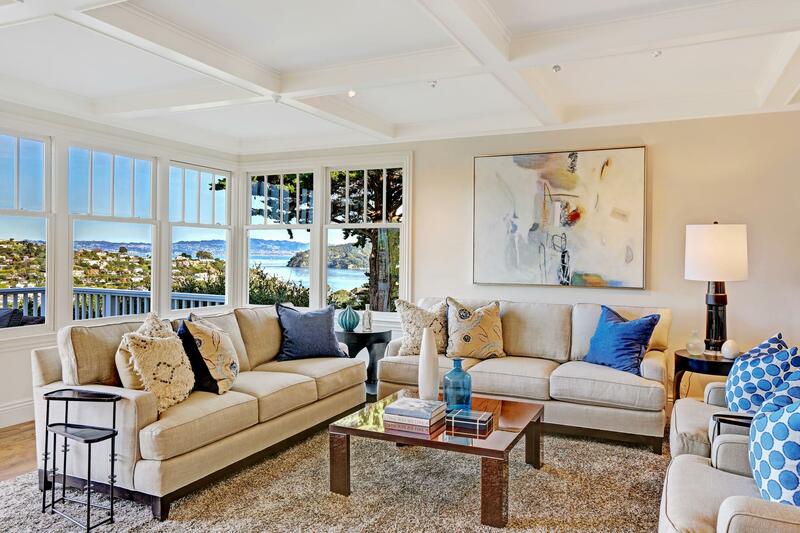 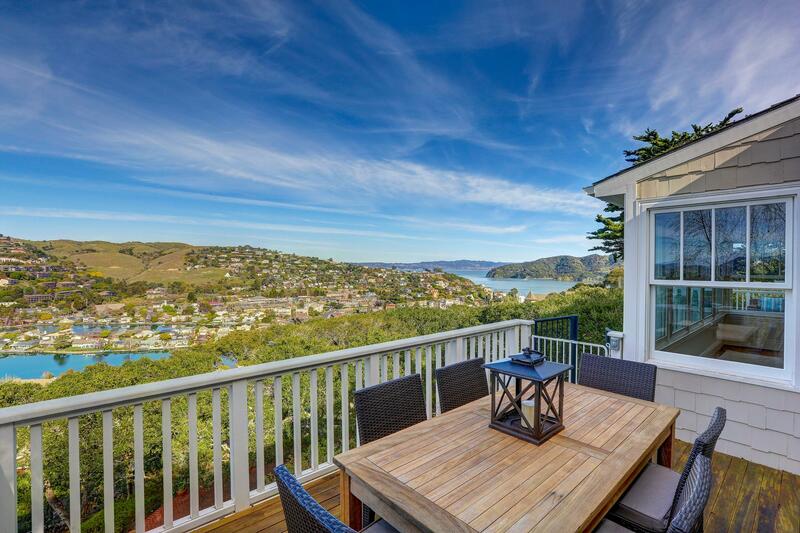 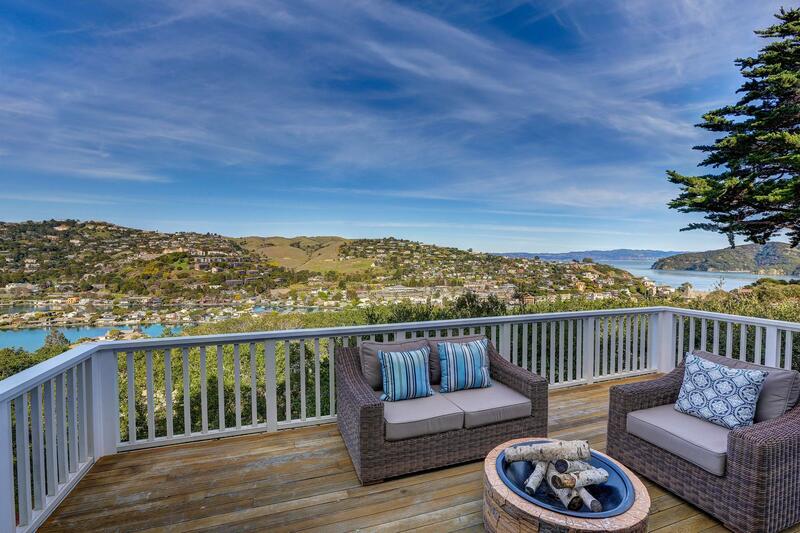 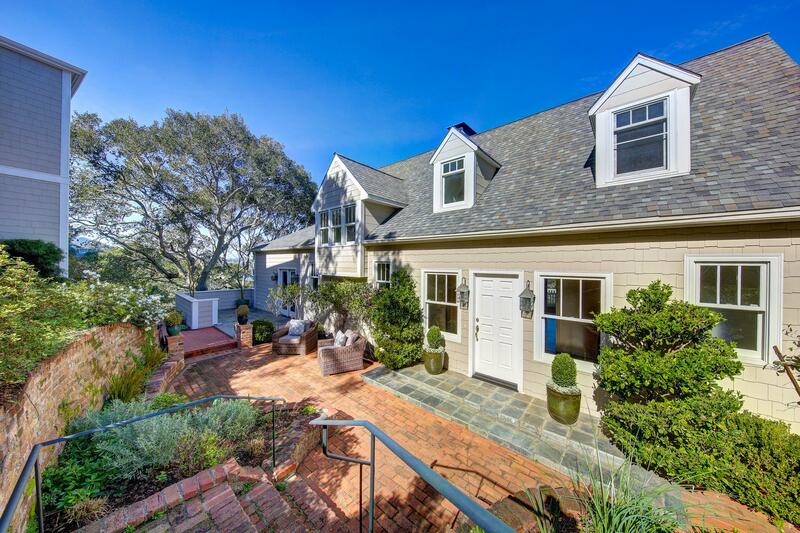 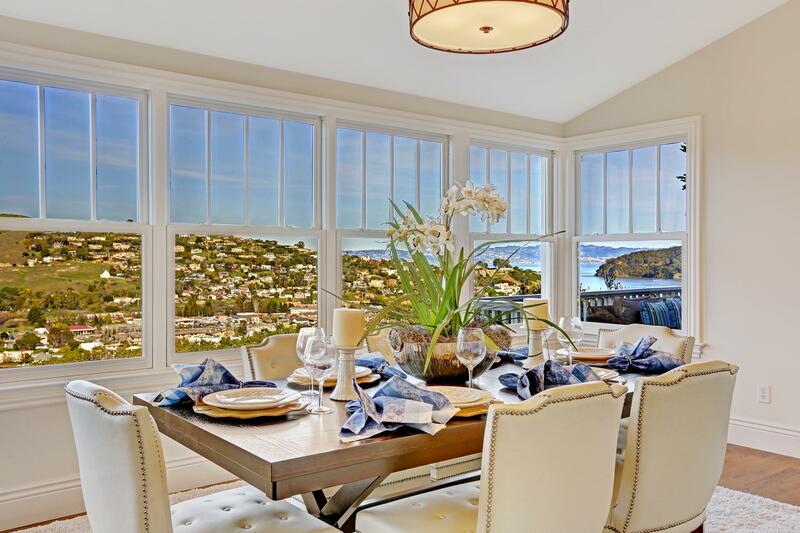 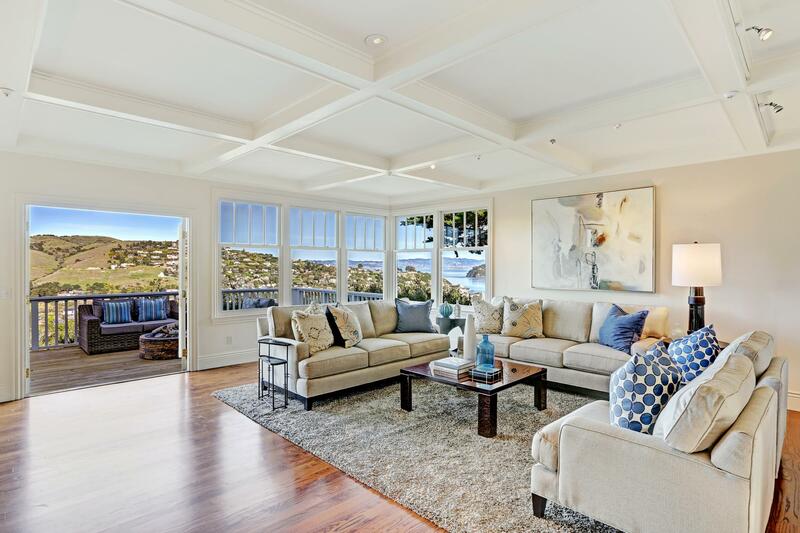 This wonderful entertaining area offers French doors which open to an inviting deck overlooking the San Francisco Bay, Angel Island, Belvedere Lagoons and sprawling hills. 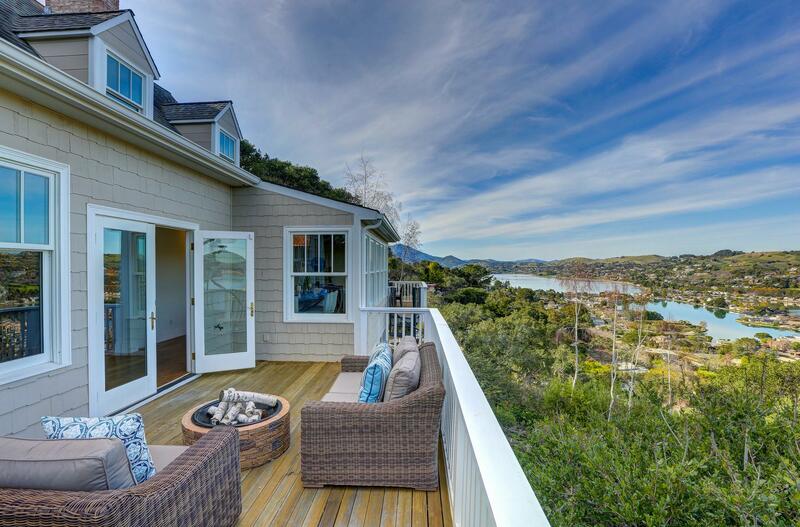 The main level offers access to two view decks providing optimal indoor–outdoor living overlooking the captivating panoramic views. 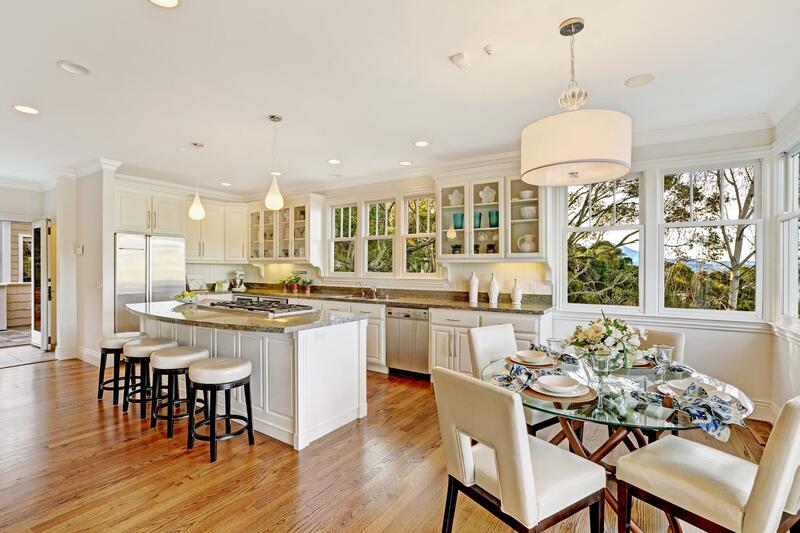 The spectacular kitchen offers style and functionality with a center island, counter seating for 4, custom cabinetry, granite slab countertops, and stainless steel appliances which include: Dacor 6 burner gas range, Miele Dishwasher, (2) Dacor convection ovens, and GE refrigerator. 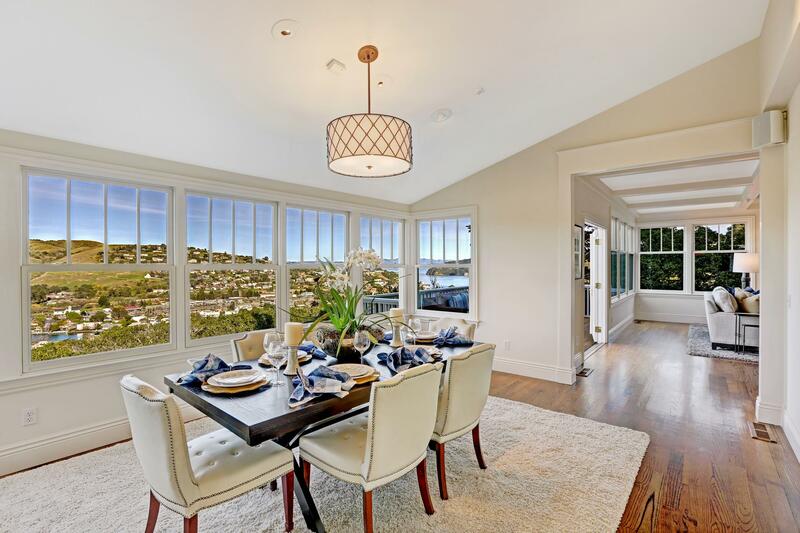 An informal casual dining area offers French doors to the entertaining deck offering picturesque views and access to the lower outdoor yard through a spiral staircase. 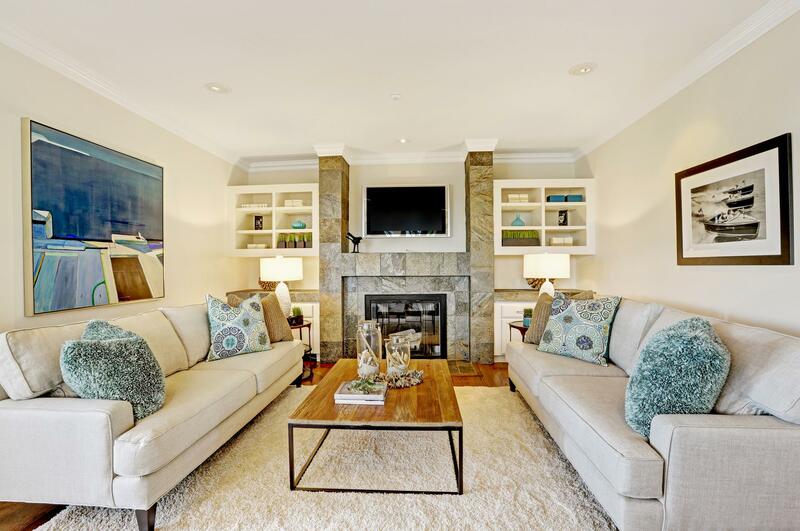 The family room adjoins the kitchen offering a wood burning fireplace, hardwood flooring and built-in entertainment center. 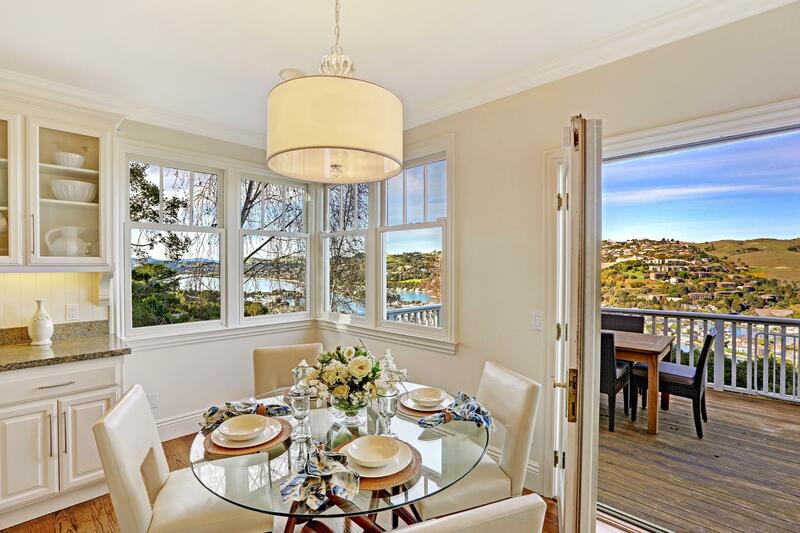 The spacious formal dining room is centrally located between the kitchen and living room providing an ideal layout for entertaining while offering stunning views. 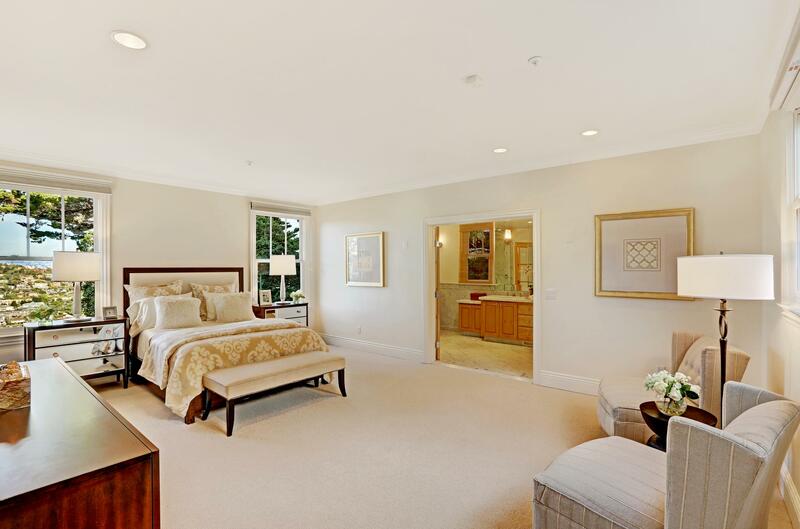 The gracious master suite is perfectly situated on the main level and offers beautiful views and two large walk-in closets. 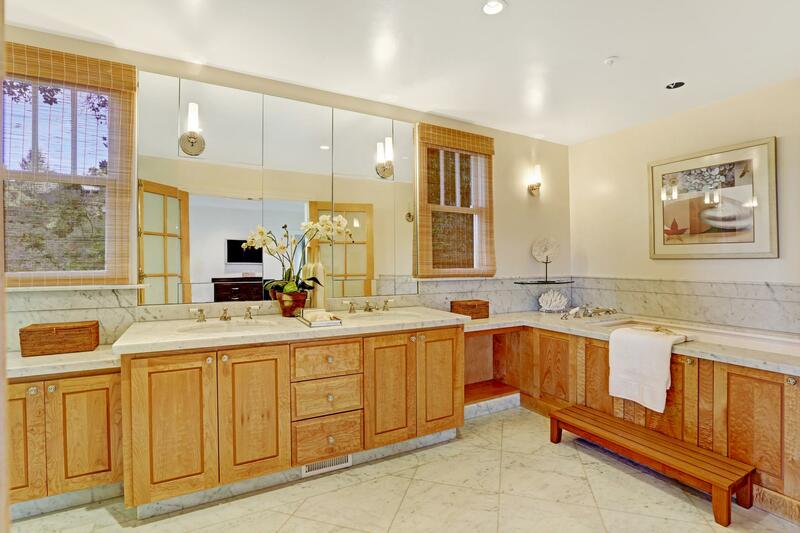 The elegant master bath offers marble countertops, dual vanities, steam shower and soaking bath tub. 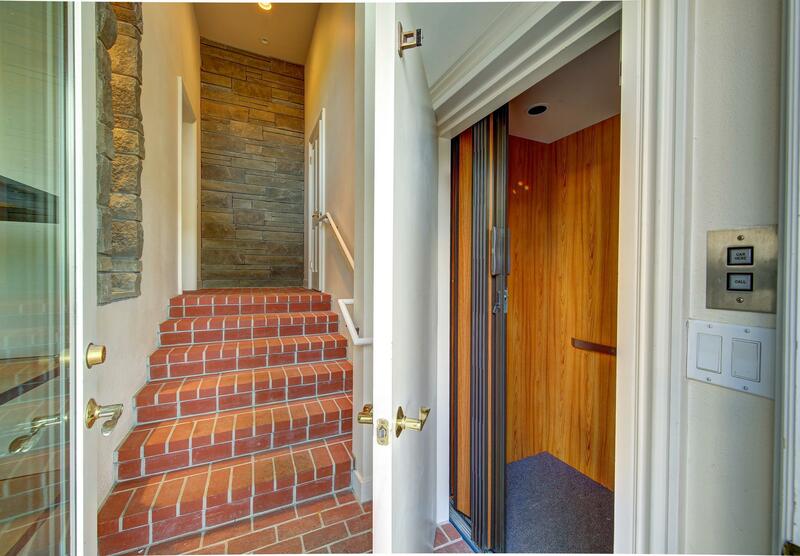 The main level powder room is located off the entry hall. 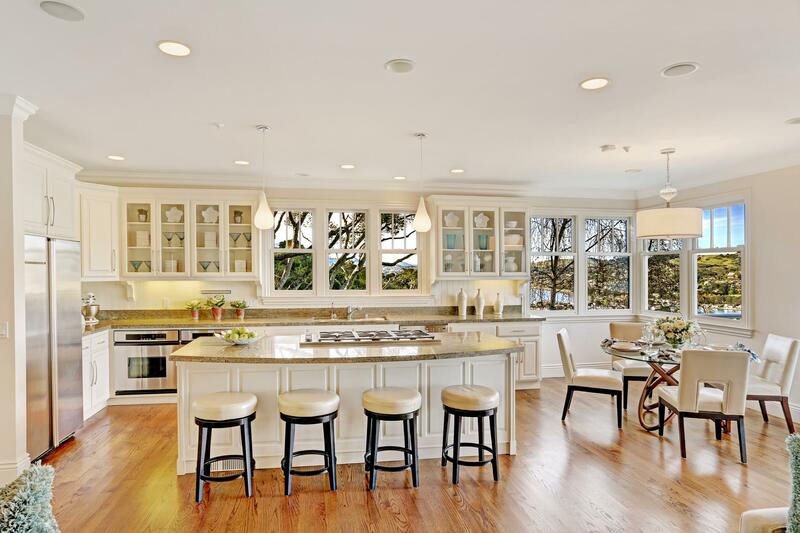 The pantry and laundry room share a room just off the kitchen. 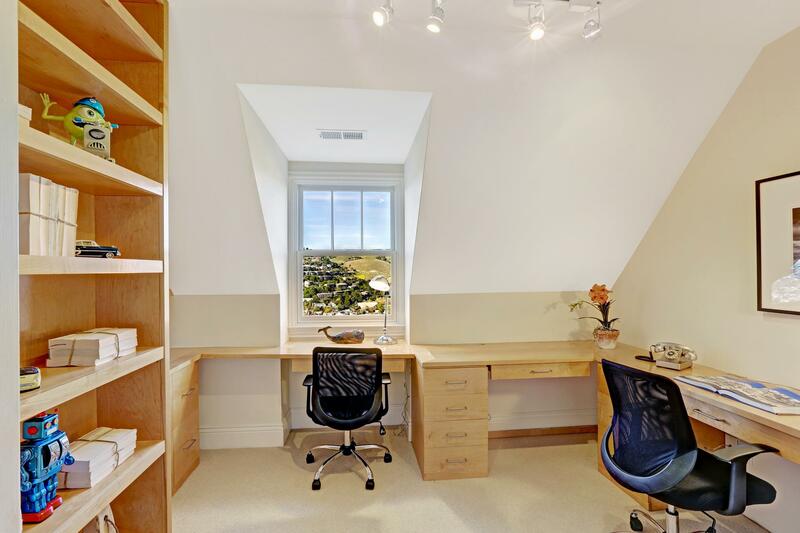 The upper level is an ideal children’s wing offering a spacious work space between each bedroom offering built-in desks, book shelving and cabinetry. 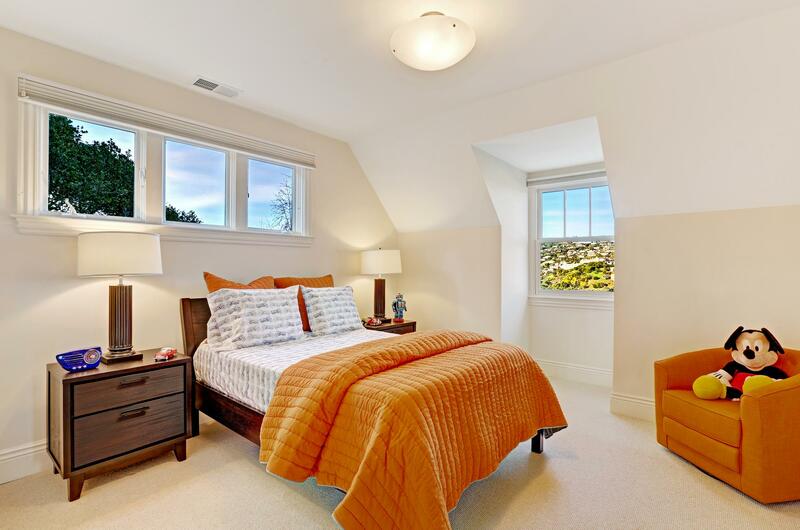 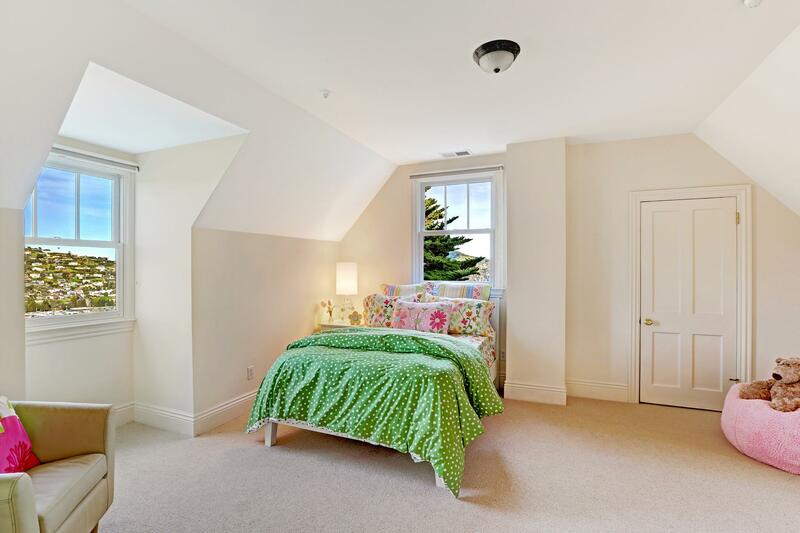 The two upstairs bedrooms offer dormer windows and natural sunlight. 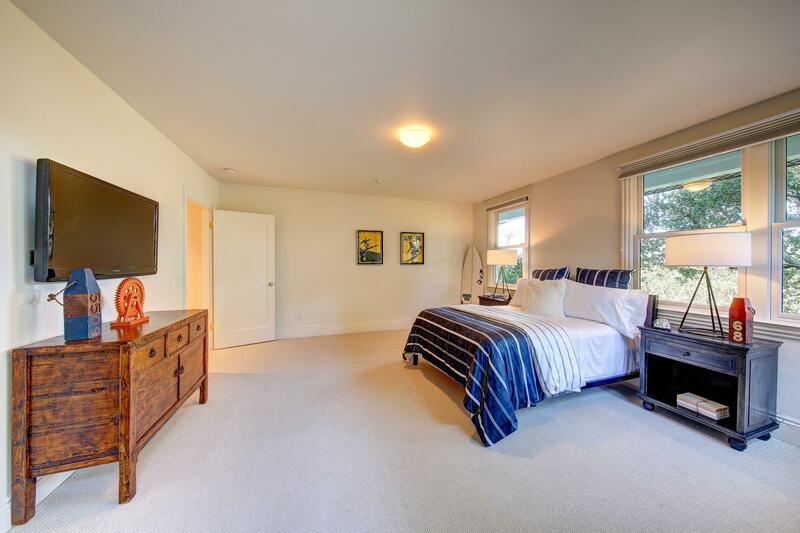 One of the bedrooms offers a large walk-in closet and a bonus room perfect for play or storage. 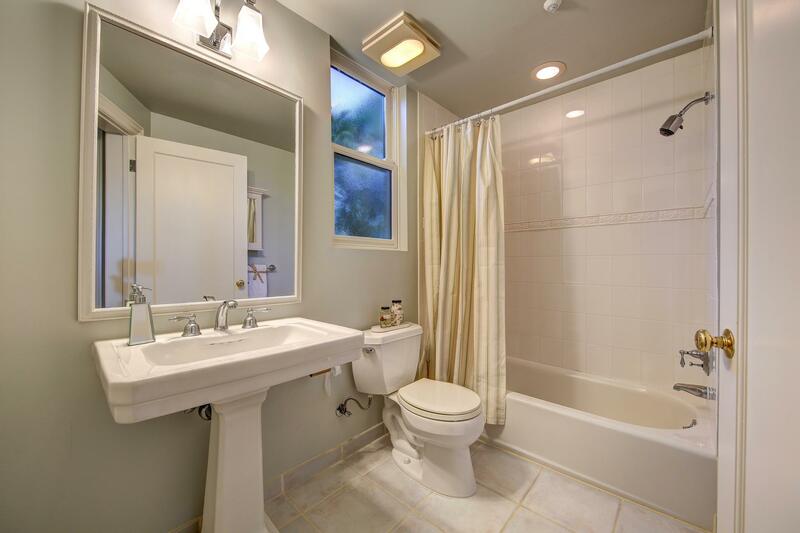 The bathroom dedicated for this level offers a tub/shower combination. 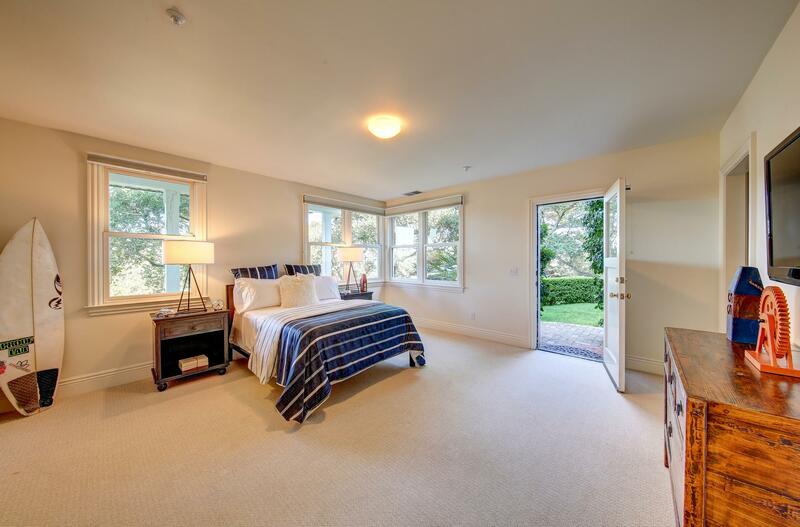 The spacious en-suite bedroom is ideal for an au-pair with an exterior access. 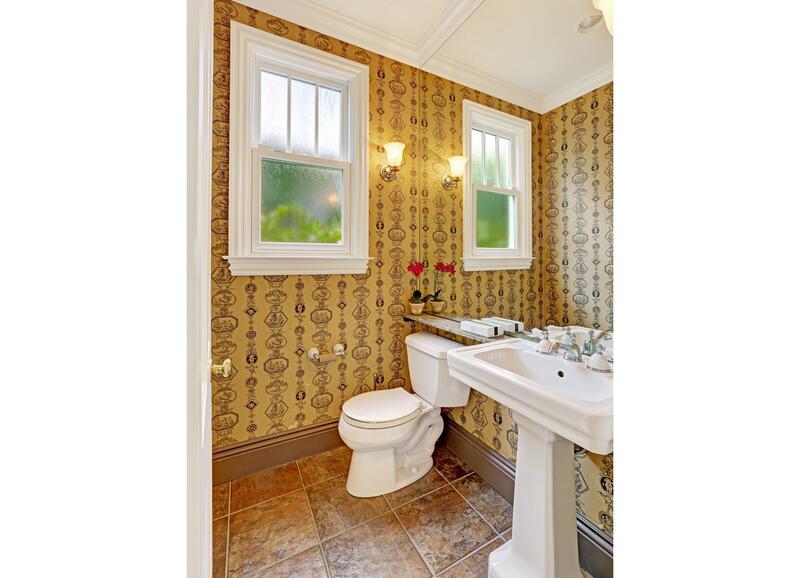 The tiled bathroom is complete with a tub/shower combination. 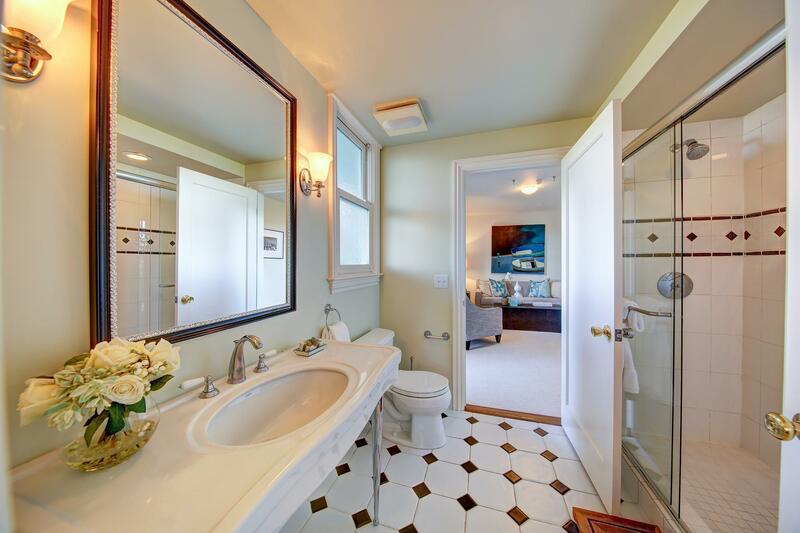 The additional guest suite is spacious and offers a full bath with a fun checkered black and white tile theme. 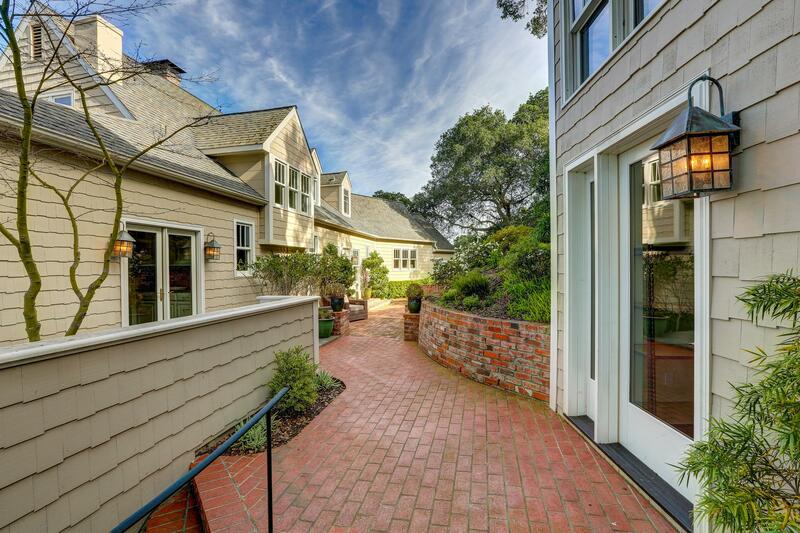 The sunny family room provides access to the rear yard offering a flagstone patio, with stairs down to the expansive brick terrace and outdoor kitchen. 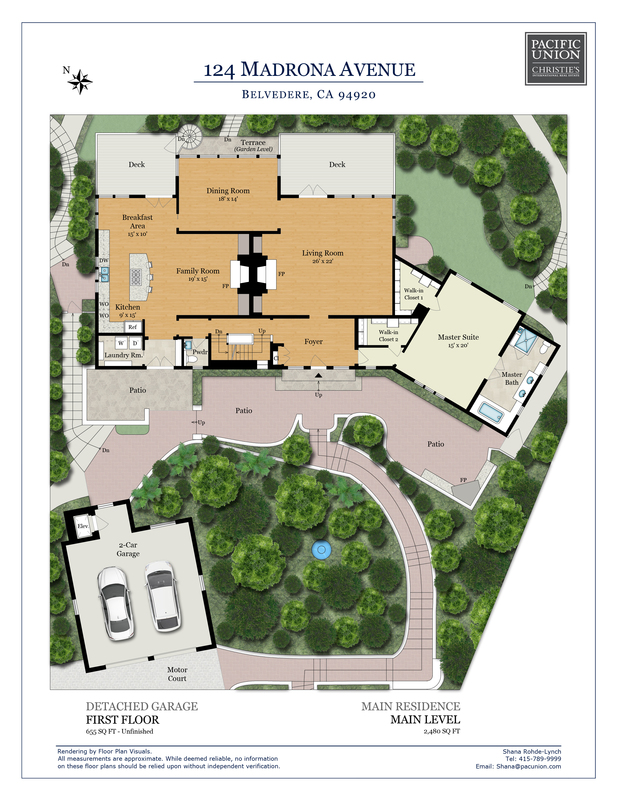 The detached 2 car garage is complete with a Tesla charging station and an elevator to the front entrance providing the ultimate convenience leading you to the main level living area. 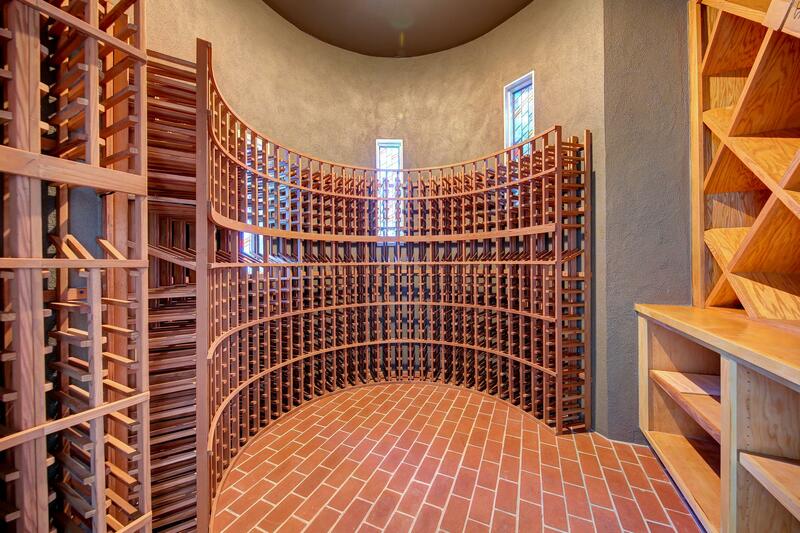 Below the garage is a custom wine cellar with curved walls, brick flooring and a stained glass window. 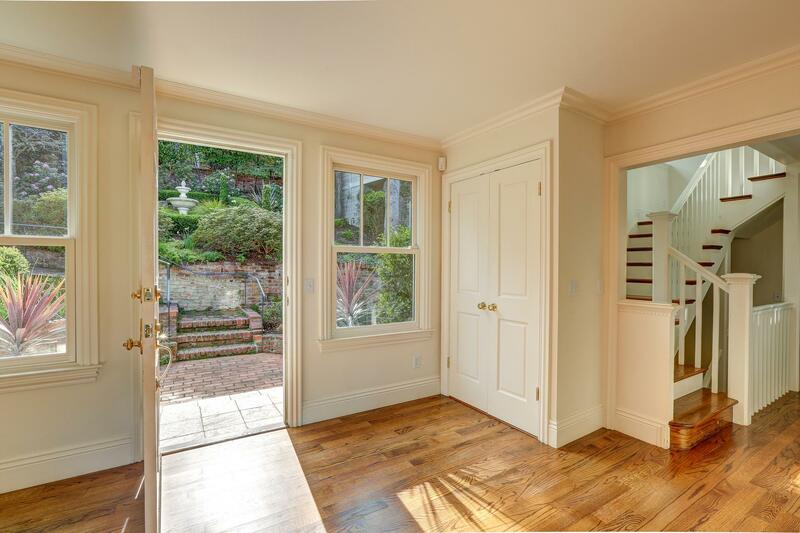 An additional storage room is also located under the garage opposite the wine cellar, an easy space for an expansion of the wine cellar. 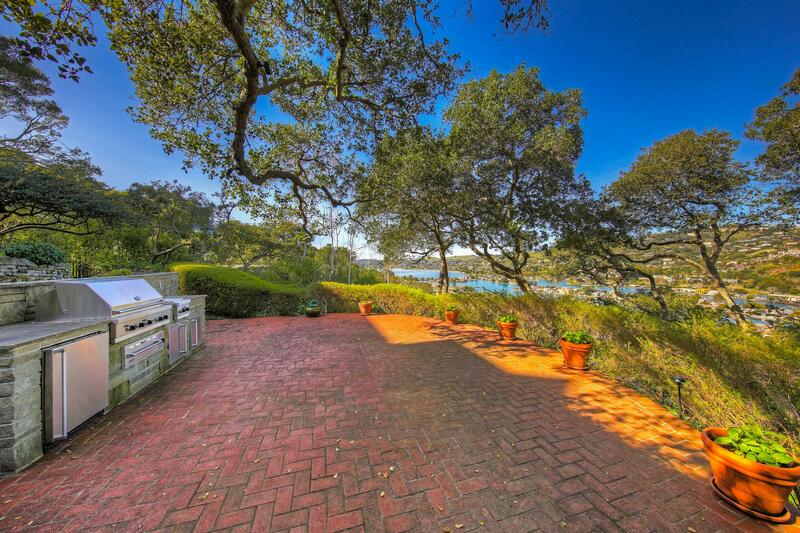 The grounds offer multiple entertaining areas, beautifully manicured lush landscape ideal for outdoor living and entertaining and incorporating all of the natural beauty Belvedere Island has to offer. 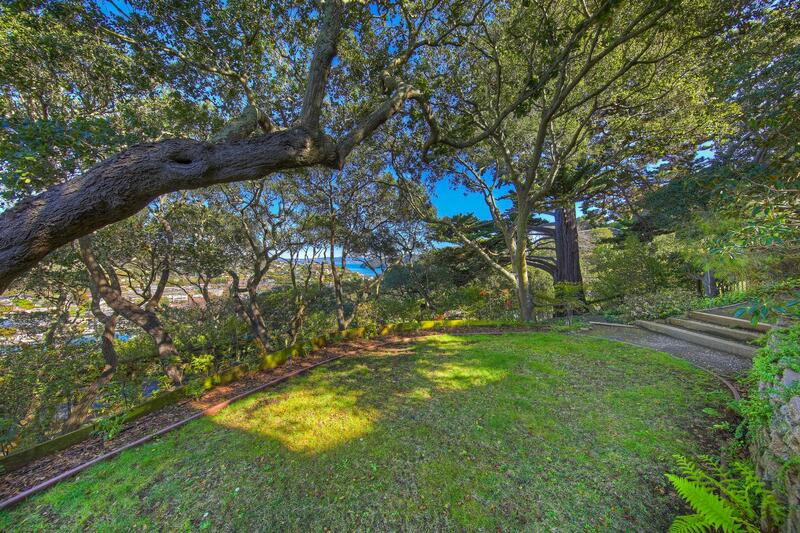 The backyard is a gardener’s delight offering an abundance of land for planting. 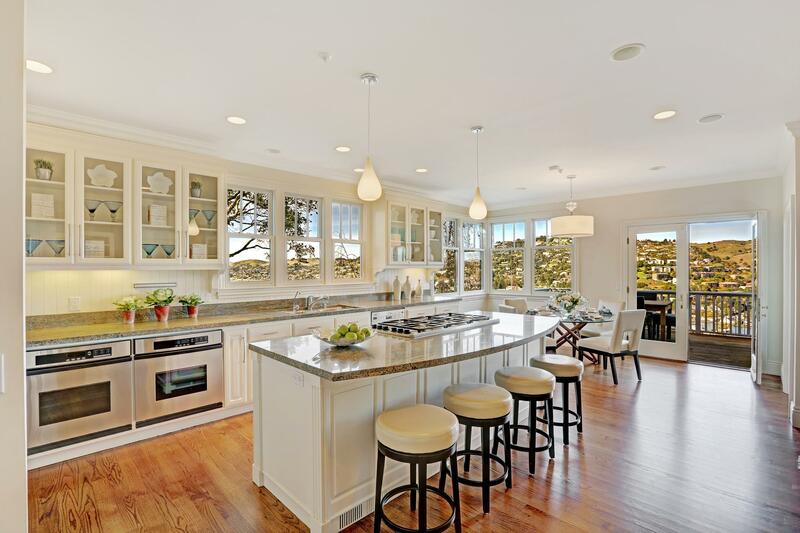 The outdoor cooking station is complete with an outdoor Viking grill, warming drawer, separate 2 burner grill and built in stainless steel refrigerator. 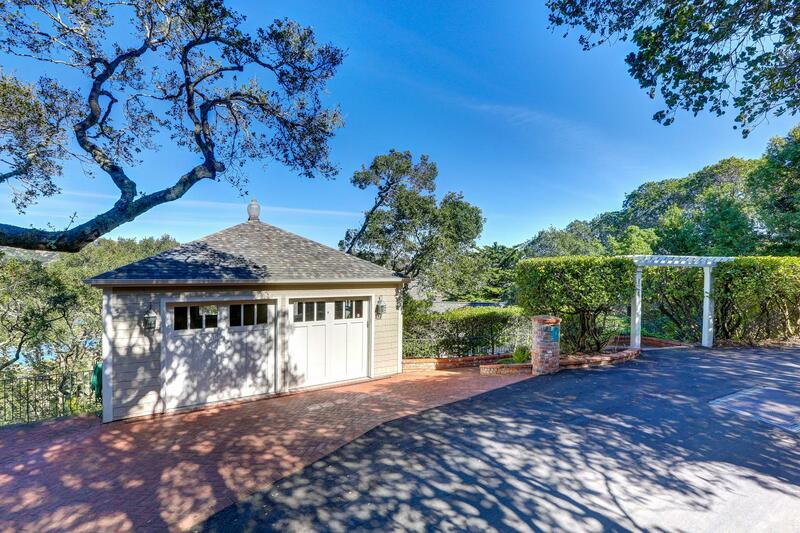 The magnificent Oak trees provide shade over the brick patio and meandering walkways lead you around the property and to the road below. 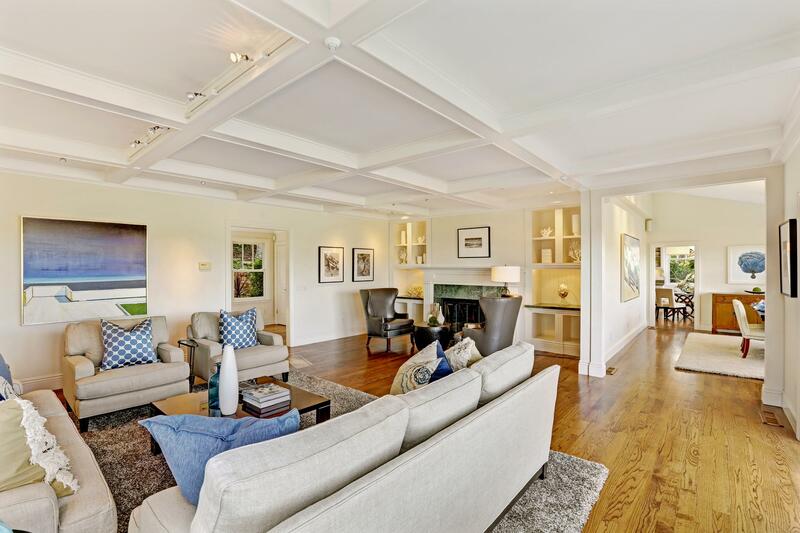 Elegantly appointed throughout, this exceptional Belvedere residence offers an enchanting setting, stylish living and tranquil relaxation in a prime Belvedere location. 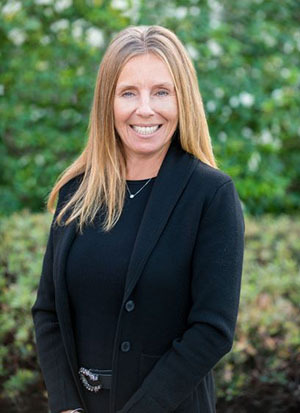 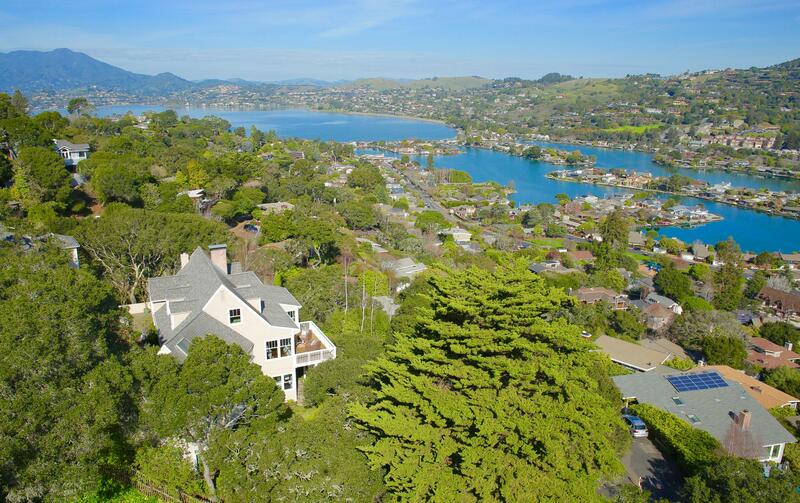 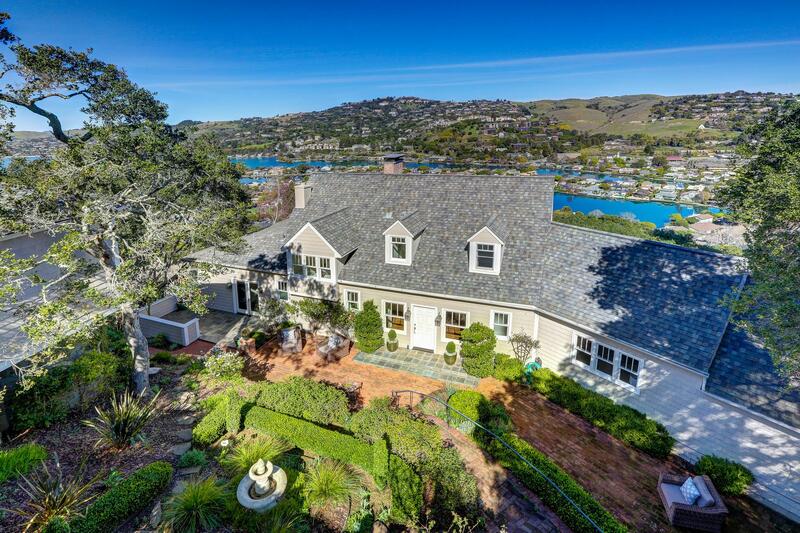 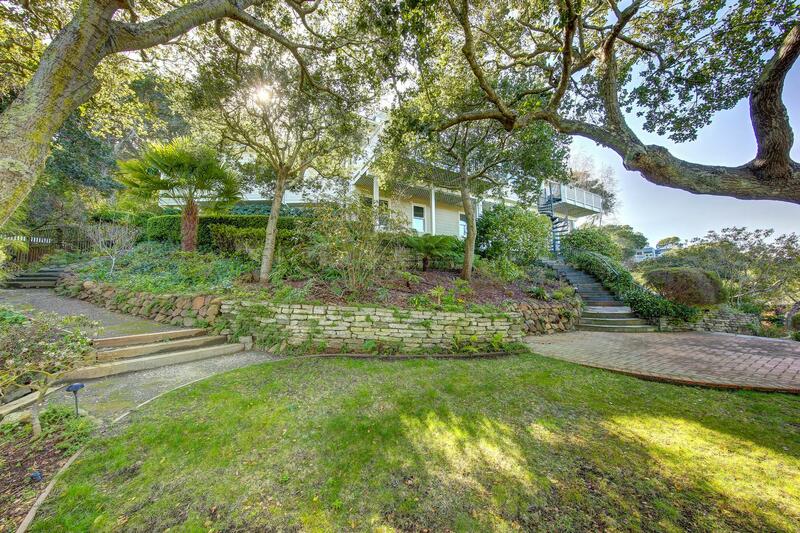 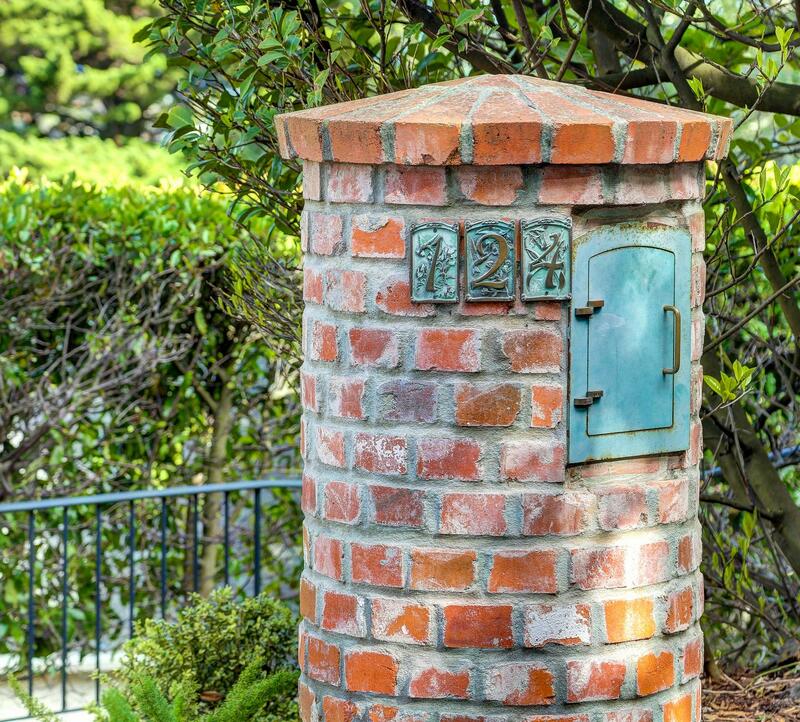 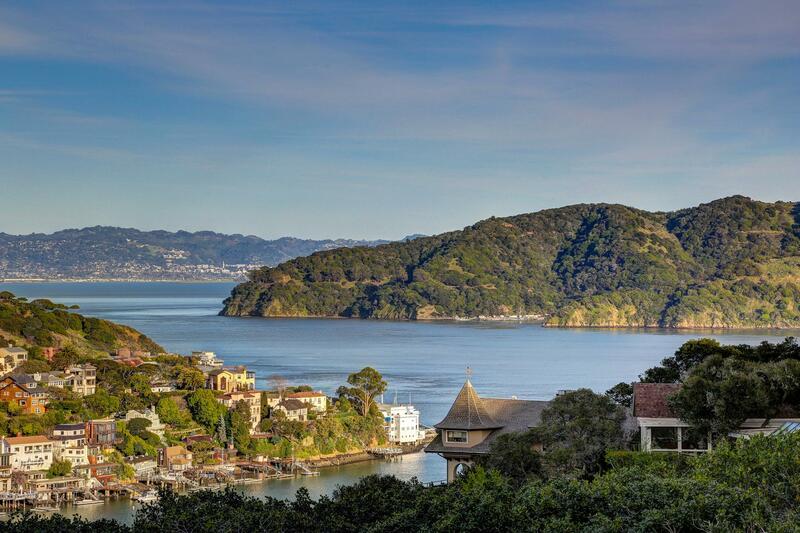 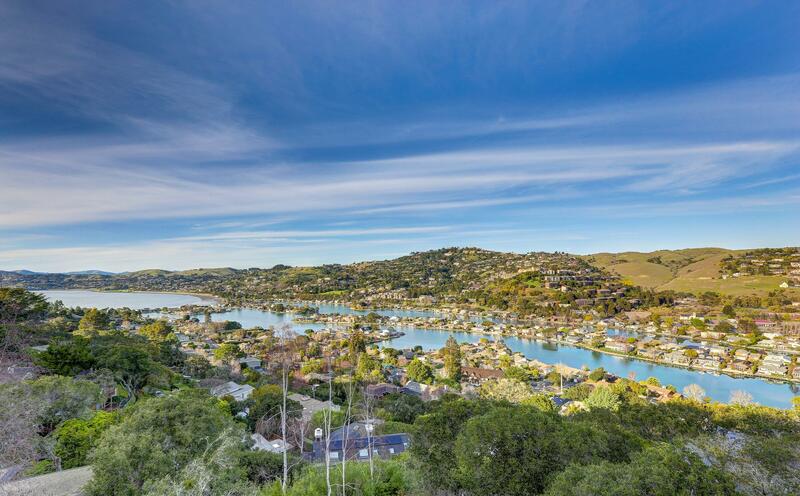 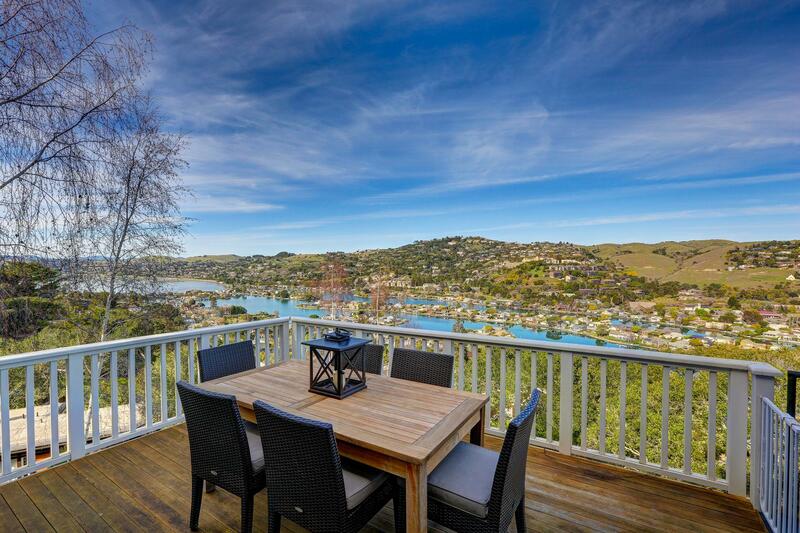 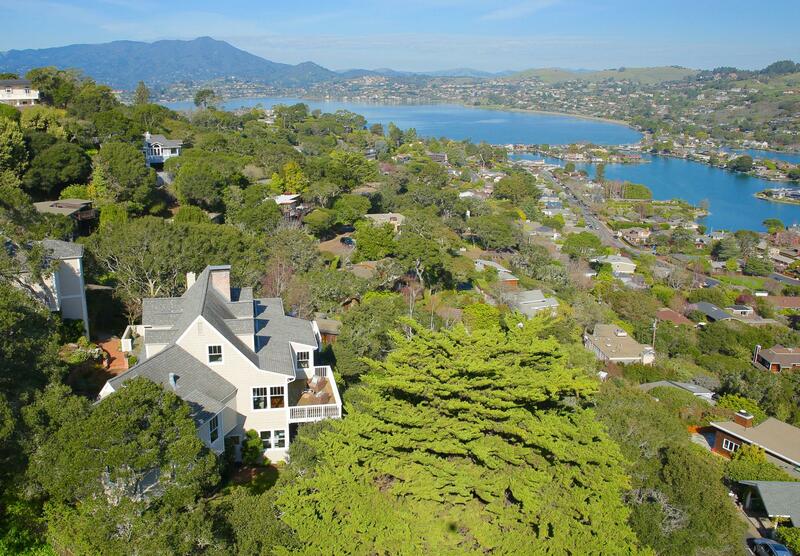 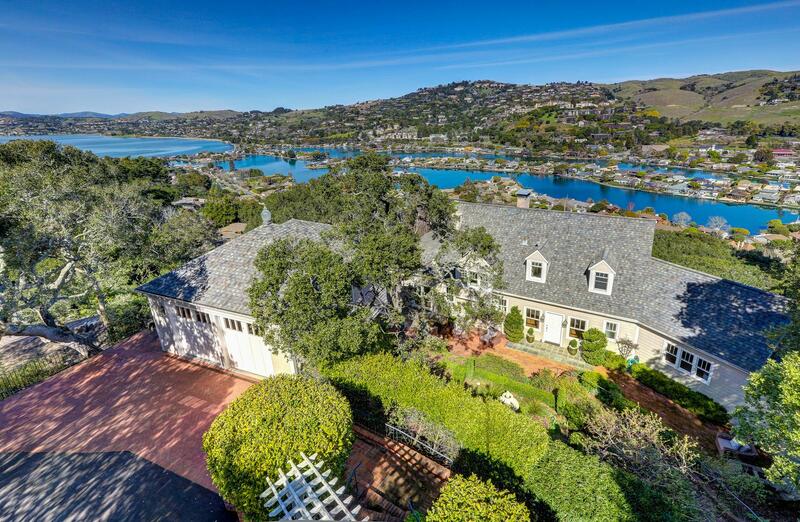 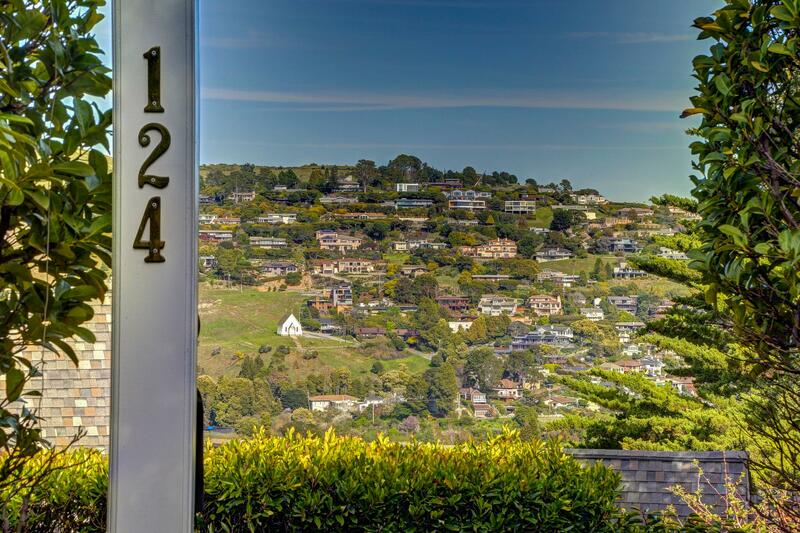 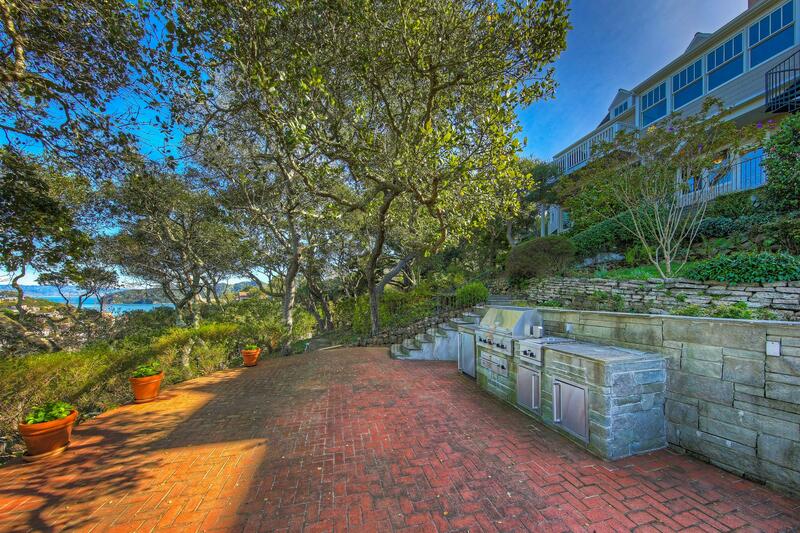 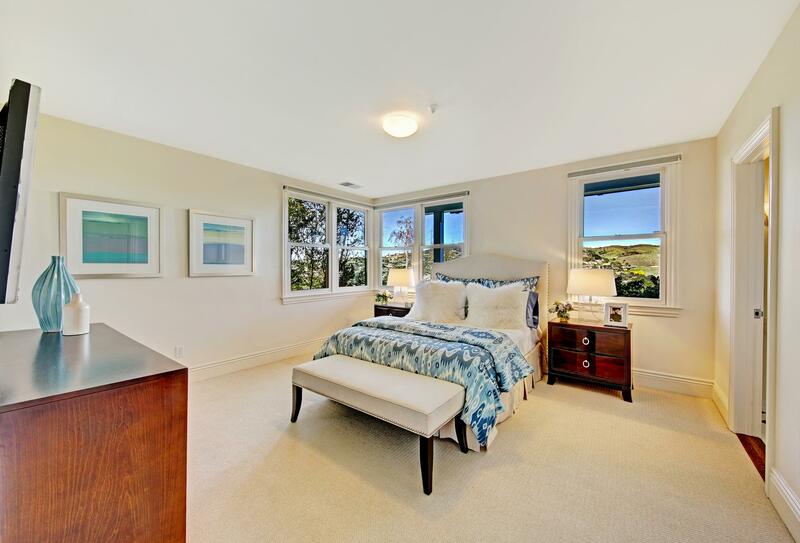 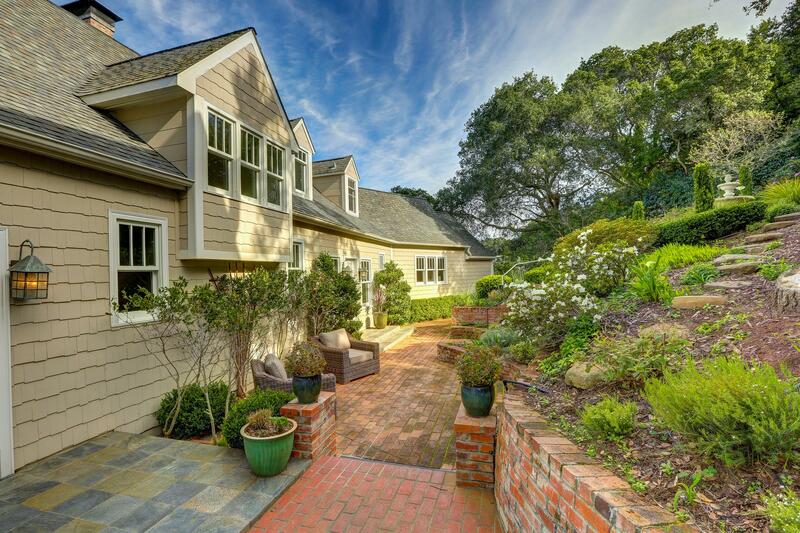 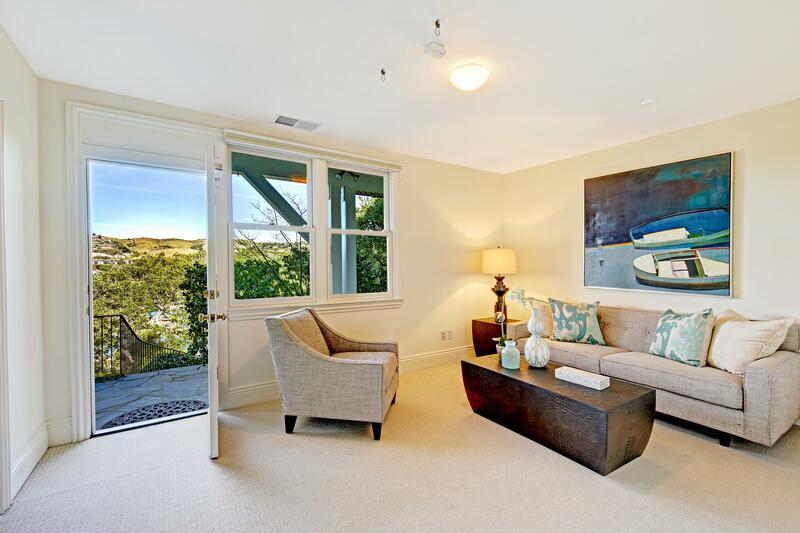 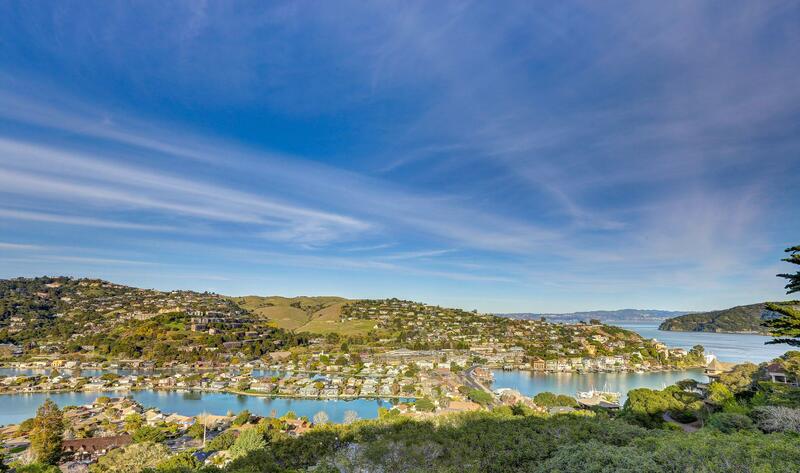 The neighborhood stairways around the island and near the property, offer easy access to the Belvedere Community Center, Belvedere Park, yacht clubs, downtown Tiburon shops, restaurants, waterfront pathways, Post Office, Boardwalk shopping center and the local movie theatre. 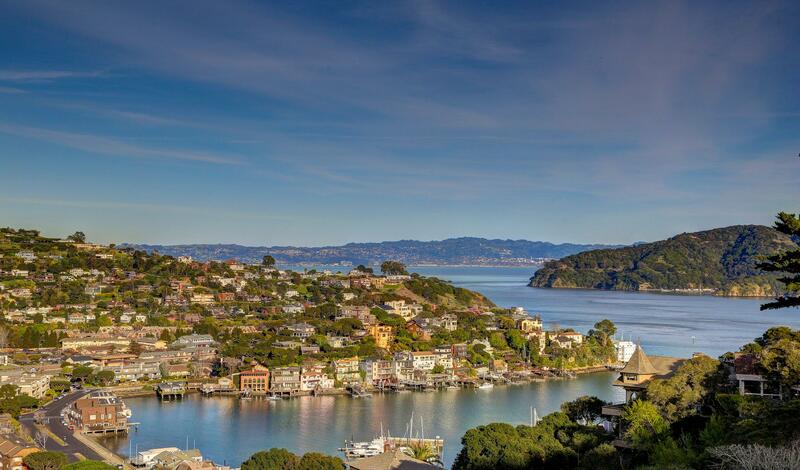 San Francisco is just a short 25 minute ferry ride, whether it is site seeing, dining or commuting to the financial district you are sure to enjoy the magical seaside lifestyle of the Belvedere-Tiburon peninsula.